Sam Tomkins insists he has no regrets over his aborted move to the NRL as he prepares to make his first appearance on British soil for two years. The England full-back cut short his stay with New Zealand Warriors, citing homesickness for his decision to return to Wigan in 2016, and that prompted huge criticism in the media Down Under. After making just 13 appearances in 2015 due to injury, Tomkins was labelled by the Rugby League Week magazine as the worst NRL buy in history. “I won’t lose too much sleep over that,” Tomkins told Press Association Sport. “I didn’t know I was top, but someone told me on Twitter about the article. “People think I’ve not enjoyed it because I cut it short a year early. That’s not the case, I thoroughly enjoyed it. It’s a beautiful place to live - I’ve kept my house there because I want to go back at some point. Tomkins was forced to miss England’s opening autumn international against France on Saturday because of the knee injury that curtailed his stint in Auckland, but is expected to be fit for the first of three Tests against New Zealand in Hull next Sunday. That will force England coach Steve McNamara into making a tough decision after going with in-form Leeds full-back Zak Hardaker, the newly-crowned Super League Man of Steel, against the French. 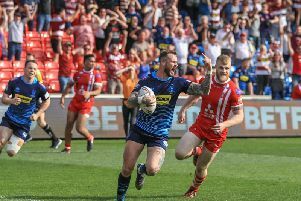 Hardaker was among those to impress in an 84-4 rout of France at Leigh and Tomkins admits McNamara is facing a welcome dilemma. “It’s good we’re in a position where Steve has got these headaches to make with me and Zak being in the squad,” he said. “People will be missing out all over the field too, and although it’s a headache for Steve, it’s a good one to have. Tomkins’ last match on English soil was England’s heart-breaking, last-minute defeat by the Kiwis in the 2013 World Cup semi-final at Wembley and he is looking forward to the chance to avenge that when the second Test is held at London’s Olympic Stadium on November 7. “I’m massively looking forward to it,” he said. “There’s a real atmosphere when you play in England, something I’ve missed, so I can’t wait to get fit. “That Olympic game is huge for us. It’s important we’re successful as a national side and especially in London. The Kiwis have arrived in England as the number one ranked country after posting three successive wins over Australia and, although they are missing a host of senior players through injury and illness, Tomkins expects them to provide a stern challenge. “They’ll be a massive test,” he said. “They’re number on in the world for good reason.